Reparto: Liam James (Duncan), Steve Carell (Trent), Toni Collette (Pam), AnnaSophia Robb (Susanna), Sam Rockwell (Owen), Allison Janney (Betty), Maya Rudolph (Caitlyn), Rob Corddry (Kip), Jim Rash (Lewis), River Alexander (Peter). 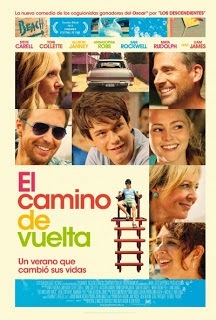 Guión: Nat Faxon y Jim Rash. Producción: Tom Rice y Kevin J. Walsh. Vestuario: Michelle Matland y Ann Roth. Productoras: Sycamore Pictures, The Walsh Company y OddLot Entertainment.